Anonymous sale, Sotheby's London, 25 October 1963, lot 145 (£950). The magnificent metamorphic library table of richly-figured mahogany is designed with tapered 'herm' legs after the mid-18th Century antique fashion. Its frieze tablets are ormolu-enriched in the French manner, with cartouche escutcheons displaying Venus-shell badges amongst Roman foliage, together with flowered and reed-gadrooned bail-handles that are framed by poetic oak branches. This masterpiece of cabinet-making is cleverly engineered as a tall step-ladder with fitted rail and book-rest concealed beneath its hinged top. The celebrated cabinet-maker John Cobb (d. 1778), who held the court appointment of cabinet-maker and upholsterer to George III and was Thomas Chippendale's neighbour in St. Martin's Lane, supplied these French patterned handles, described as 'Large Handsome wrought furniture' for his 'Commode' of 'extra fine wood' supplied to James West of Alscot Park, Warwickshire in 1766 (L. Wood, Catalogue of Commodes, 1994, p. 51, fig. 35). The commode's superb bead-framed veneer corresponds so closely to this library table, that it is likely to have been executed at the same period. In addition the antique hermed legs are provided with trompe l'oeil flutes headed by arch-beading such as Chippendale introduced to the Nostell Priory medal-cabinet, for which the invoice was dated 1767. The escutcheon pattern relates to those illustrated in Thirty Three Shields and Compartments for Monumental Inscriptions, 1731 and engraved from the designs of the architect James Gibbs by John Clark. 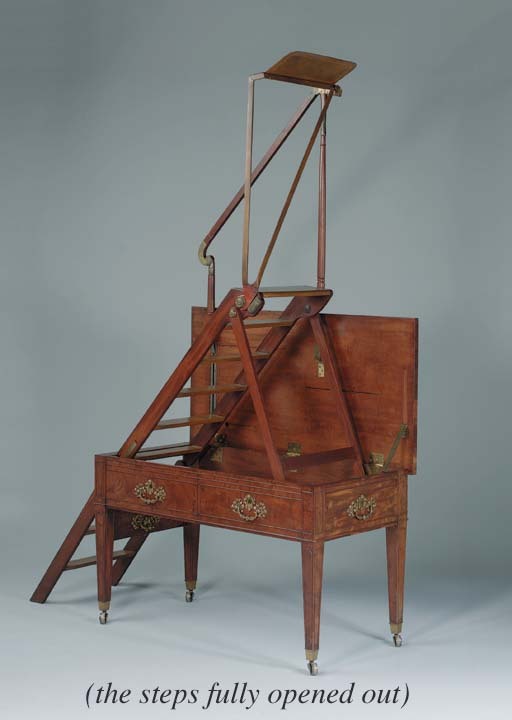 A pattern for related folding library steps was first published in Messrs Ince & Mayhew's Universal System of Household Furniture, 1762 (pl. XXII). Thomas Sheraton in his Appendix to The Cabinet-Maker and Upholsterer's Drawing Book, 1793 (pl. V) published the pattern of a closely related metamorphic library table that was supplied to George, Prince of Wales, later George IV and manufactured by Robert Campbell (d. 1780) of Porter Street. The latter was a subscriber to Thomas Chippendale's The Gentleman and Cabinet-Maker's Director, 1754; and is recorded in 1774 as taking out a patent on such library steps 'contained in tables'.